Yesterday was a lazy afternoon here at the Lake. Squirly wind (i.e. no sailing) + lots of clouds (i.e. no attempts at ridding myself of the pallid glow I currently exude) = reading time. I situated myself on the hammock and re-attempted to tackle a book from my reading list called How Italian Food Conquered the World. So far, this book has conquered me. It's...very impressive how much research the author did about Italian food's upbringing, but the history just wasn't snatching my attention. 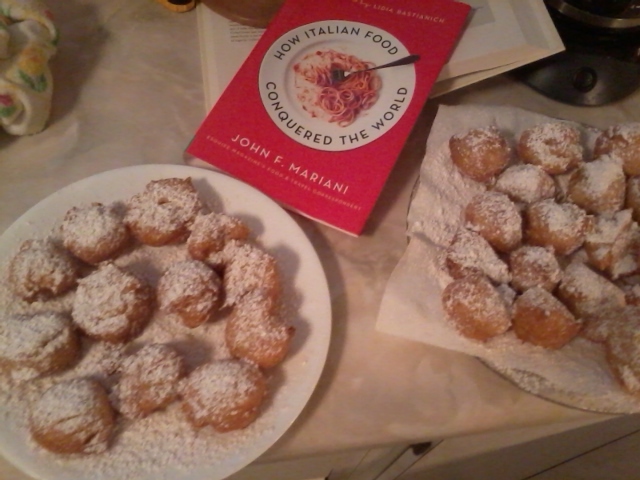 That is, until the author mentioned the word zeppole, and the fact that a recipe for these puffy, decadent pastries was on the next page. Before we began, we checked if all the ingredients were available at the Lake House. It was a surprisingly short list, so all systems were go. 2. 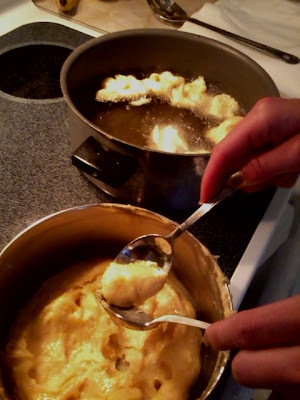 Once the butter/sugar mix came to a boil, we took it off the heat and dumped in the flour (the instructions read, "add the flour all at once"), and stirred "vigorously" until it was mixed well and [slightly] resembled dough. At this point, it seemed kind of like mashed potatoes, honestly. 3. We returned the pan to the burner, turned the heat to medium, and stirred the dough for another minute before removing from the stove again. Now it had a more dough-like appearance. 4. Then Z brought out the hand-held mixer and put it to work as I added the eggs, one at a time. The ingredients at this point needed to be pretty well incorporated, so the mixer got turned up to medium for about a minute until we achieved this. 8. 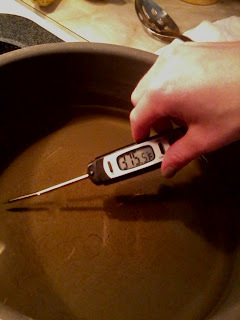 At the right temp. (375˚), the zeppole [called such because they puff up, causing their creators to bring Zeppelins to mind] should pop/spin/turn over on their own when one side is browned--We were like little children when this happened. It's really quite a cute little spectacle (the pastries flipping over without assistance, not us acting like children). 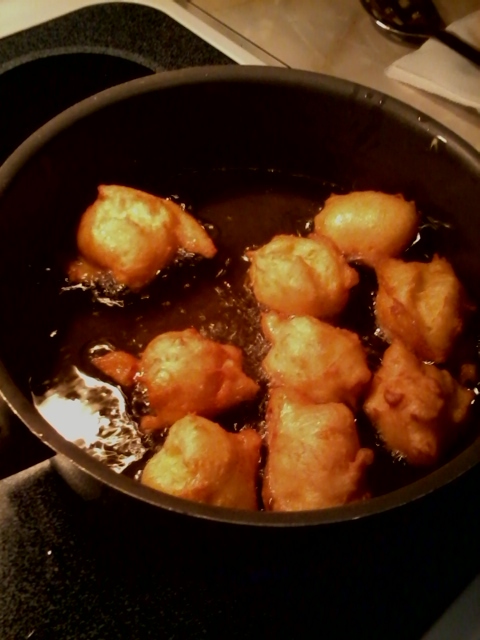 Annnnyway, our instructions said to keep the dough in the oil for ~6mins, "until the zeppole are nicely browned," so that's what we did. More on that later. 9. 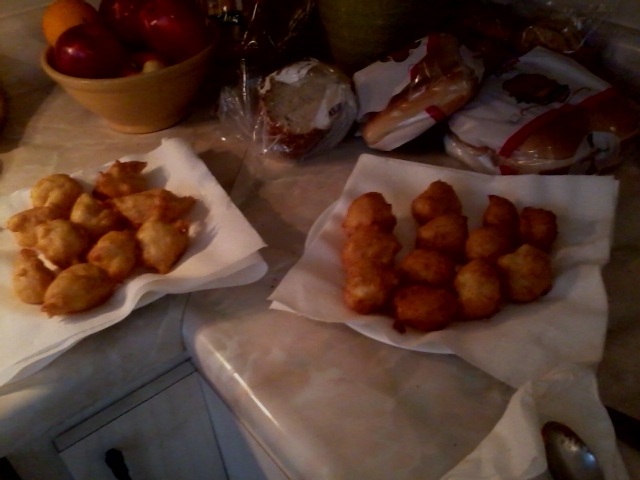 Once we deemed the dough properly fried, we scooped them out of the pan and let them "drain" (what an unappealing word...) on paper towels. 10. 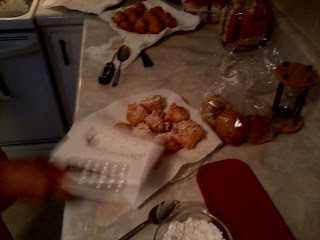 It took us three rounds of ~9-12 zeppole until the entire batch of dough was used up. Again, we had to keep an eye on the oil temp the whole time, as adding the dough made the temp. drop pretty rapidly. 11. 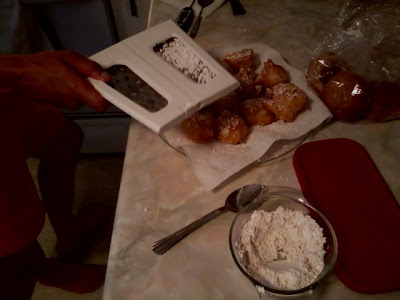 In a separate bowl, Z mixed up the powdered sugar and the cinnamon so that we could add a nice dusting of the stuff overtop the 'drained' dough. If you have a sifter, use that for this step. 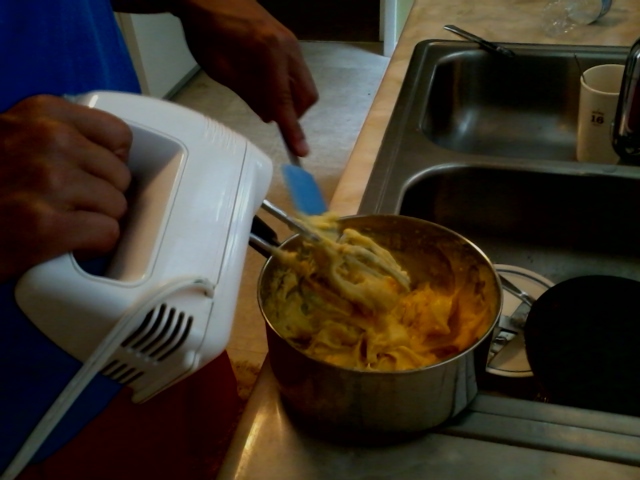 We weren't so lucky, so a cheese grater was the closest we could get. Shake, rattle, and roll, baby! I have to admit that, while I know I've had this dessert some time in my life, I don't realllly know what they're "supposed" to taste like. Z and I thought they were a little doughy on the inside, and my sweet tooth thought the dough could have used a drop or two of vanilla extract or something. My mom also claims that her mother's recipe calls for bakers' yeast (which our recipe lacked), so who knows. After tasting the first batch and experiencing said doughy-ness, we thought, Hmm, maybe we didn't leave them in long enough... Truthfully, I was enraptured by the golden color of the dough in the oil and probably [prematurely] took them out of the pan at this early stage, i.e. 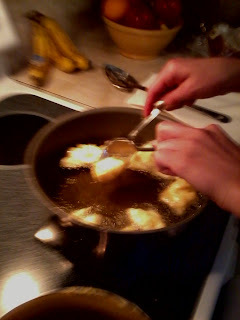 before they were "nicely browned" as the recipe called for. On the 3rd batch, Z took over with the intention of heating them longer than the first 2 tries, but they still came out a little soft in the center-- this time, most likely due to the not-quite-hot-enough oil. That was my bad again-- I freaked out and turned off the heat when it got too hot between batches, and forgot to turn it back on...woops. 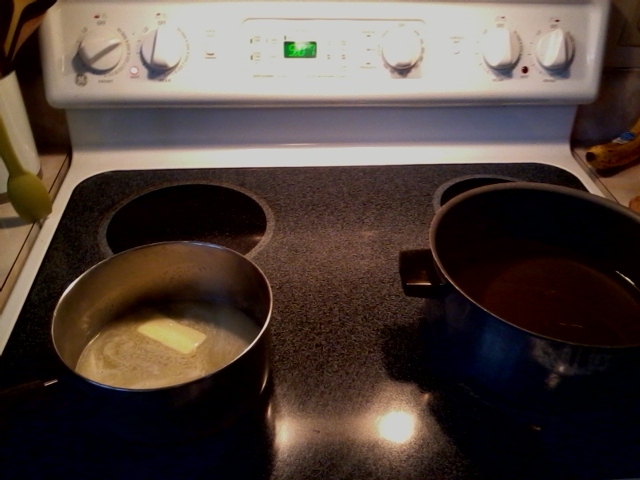 After mixing yeast and water, let sit 5 min then add to above ingredients. In warm oven, cover with towel and leave 1 hr.